I’m so excited to share with you that a brand-new season of Thunderbirds Are Go will skyrocket onto Amazon Prime Video in the U.S. this Friday, April 21! 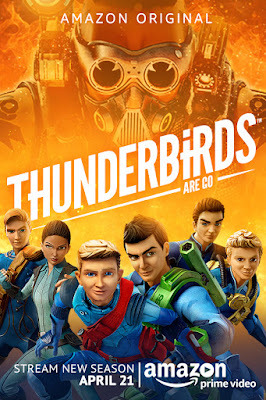 Thunderbirds Are Go delivers an exciting new level of action-adventure animation for today’s audiences while paying tribute to the characters and locations from the beloved original Thunderbirds series. My boys love this series, it provides great science and technology information, but with a playful suspenseful adventure. Very cute!!! When disaster strikes, International Rescue answers the call – and it’s Thunderbirds Are Go! From their hidden island base in the South Pacific, the five Tracy brothers pilot remarkable, cutting-edge Thunderbird vehicles from the depths of the oceans to the highest reaches of space, all for one purpose: to help others in need. In Season 3, International Rescue faces their toughest challenge yet, The Mechanic, who uses his “mecha machines” to create chaos. Produced by ITV Studios and Pukeko Pictures in collaboration with world-famous Weta Workshop, the series features a unique mix of CGI animation and live-action model sets.